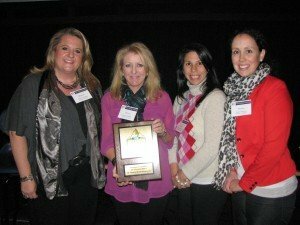 Michele Talwani, Theresa Dolloff, Lauren Bombardier, and Pamela Hawkes, of Families in Transition, accept the 2013 Summit Award. The chapter’s 2013 Summit Award recognized excellence in event-based PR strategy, and was given to Families in Transition of Manchester for their Cinco de Mayo event. Michelle Talwani, director of economic development and marketing, is a long-time chapter member and former board member. Past president Susie Dimick Stone presented the award. Dyn, the world leader in Internet infrastructure-as-a-service, received the Summit 2012 Award for excellence excellence in the engagement of employees as ambassadors as an integral component of an organization’s public relations philosophy. Dyn (pronounced “dine”), based in Manchester, was recognized for believing in the value of employees as ambassadors, applying this philosophy to nearly every aspect of their operations. Rather than simply relying on their sales force or marketing team, they see every single employee as an ambassador of the Dyn brand: in product and culture. As a result, Dyn was named one of the most democratic workplaces of 2012 by WorldBlu, and has been repeatedly named one of the best places to work by Business NH Magazine. Dyn powers managed DNS and email delivery for more than four million enterprise clients, small businesses and home users. Dyn helps websites run faster and be more reliable, while also ensuring that transactional emails that consumers want and need reach their inboxes. The NHHEAF Network Organizations, based in Concord, NH, earned the PRSA Yankee Chapter’s Summit Award in recognition of the nonprofit organization’s excellence in educating and engaging the public during a time of dramatic change in the student loan industry. The NHHEAF Network utilized a variety of tools, including print and the web, to build support for modifications to proposed federal legislation that could have had a dramatic, and negative, impact on its ability to continue to be an effective college planning resource. The campaign was successful, and today the network’s organizations continue to serve more than 30 thousand New Hampshire students and parents with college planning resources. The NHHEAF Network Organizations includes: New Hampshire Higher Education Assistance Foundation (NHHEAF); Granite State Management & Resources; and, the New Hampshire Higher Education Loan Corporation. The inaugural Summit Award, in 2010, recognized excellence in the use of social media as the primary tool utilized in a public relations campaign. 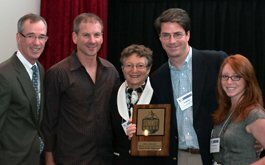 The award winner was the Kelliher Samets Volk agency, of Burlington, Vermont. The firm utilized an array of social media tools, including Twitter and Facebook, to effectively support the business goals of Stowe Mountain Resort.